It's that time of year again when we introduce our most innovative, exciting features for the CoughDrop app! CoughDrop is a great cloud-based AAC system that will run on just about any device -- iOS, Android, Kindle, Windows, Chromebooks, etc. We offer a two-month free trial so you can try it out for yourself and see if it will work for you. We're always adding exciting new features to CoughDrop, from GPS-based board links to communication goal setting and tracking, to powerful logs and reports and even user-earnable badges. But today we're talking about a brand new feature that we're super excited about. We call it: Record Scratch. 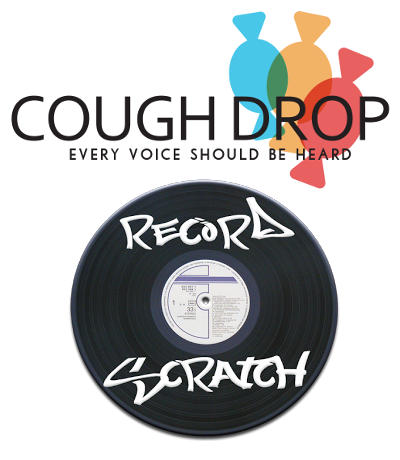 Record Scratch is a new type of button in CoughDrop that, once enabled, allows the communicator to actually freeze time and narrate their own situation. This can be extremely useful, as you can see in some of the example videos below. Basically what happens is, when a communicator feels like they're going through a particularly frustrating, ironic, or even just boring situation, they can hit the Record Scratch button and CoughDrop will rewrite the laws of physics to stop the progression of time for everything in the universe except them and their device. Then they can craft a narration and any cameras, phones, Go Pros or whatever else that happen to be filming at the moment will automatically record the narration for posterity. We know many communicators have different needs and accommodation requirements, which is part of why Record Scratch is so great. Record Scratch can freeze time for as long as the communicator needs to build their self-narration, so they don't have to worry if their motor apraxia keeps them from talking as quickly as they'd like, and the whole universe is suspended, so there won't be anybody to finish their sentences for them if they can't seem to wait long enough for a complete response. Once caveat about Record Scratch: messing with temporal physics takes a lot of power, so make sure your battery is fully charged before trying to use Record Scratch. We recommend purchasing a 1.21-gigawatt-hour battery backup*, especially if you're planning to use Record Scratch on a regular basis. We love providing innovative tools and features to the AAC community, and we're excited for you to try Record Scratch out for yourself. Let us know what you think! *Happy April Fool's Day! We love communication, and while we can't actually freeze the universe to give communicators more time, we do want to help the people around them know how to help. We're running an online AAC conference this summer for that very reason, we'd love to see you there! Psssst, want to get great AAC for half price?